Enjoy a northern home-style welcome as you travel by dog team through spectacular Yukon wilderness. Our dog sled tours offer you a chance to start at the basics and learn to drive and care for a dog team as well as getting to know the individual dogs. Wilderness Location at Lake Laberge: Our unique location offers guests a taste of wilderness living as well as a dog sledding experience. With no road access to our home and cabins on the east side of Lake Laberge, you arrive and leave by dog team (or occasionally snow machine). We are "off the grid", so lighting comes from candlelight at supper and breakfast or from 12 volt battery lights, which are charged by solar panel or small generator. Water for your washing needs is hauled in buckets from the creek that flows behind our house. For warm wash water, you can heat water on the wood stove in your cabin (or if staying in the little cabin, which has a small propane furnace, your hot water will be sent down with you in insulated bottles). Cold drinking water comes from a well. A trip to the outhouse behind your cabin is an opportunity to enjoy the mountain scenery or look at the stars - or even watch the northern lights if they are out. Our wilderness "backyard" is hills, forests, lakes, mountains, creeks, ridges, meadows, and valleys. Travelling by dog team is an amazing way to explore it, with only the sound of the sled runners and the dogs breathing as they trot through the snowy landscape. This has been our family's year-round home for over 30 years and we are happy to share it with you. 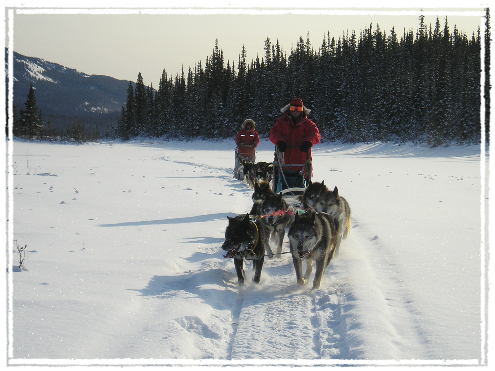 Personally Guided: Our dog sled tours are personally guided by our family members, who are past veterans of the 1000-mile long Yukon Quest Sled Dog Race and have over 30 years of guiding experience. For a more homelike atmosphere, we keep our group sizes small - maximum of 4 to 8 guests staying at our cabins at a time and a maximum of 3 to 4 guests driving dog teams with each guide. Dog Sled Steering Techniques: Dog mushing involves learning basic techniques for steering and controlling the dog sled, observing the dogs, and helping them do their jobs. Sometimes, you stand on the dog sled enjoying the scenery. Sometimes you steer by weight shift or by putting a foot in the snow. Other times, you will help the dogs by pumping with one foot or walking or running up a hill behind them. Fitness for Dog Sledding: Guests should be in good health, but don't need to be "super athletes." Most trips require a decent fitness level (similar to skiing or hiking). If you would like to come, but are not sure if your fitness level is adequate, please feel free to ask. (We may be able to design something suitable for your fitness level.) As people all have different fitness levels, it is our goal to adjust our trips to individual abilities and comfort levels as much as possible. Non-smoking: For health reasons, we do ask that our guests are non-smoking.